Kool Runnings Water Park and Anancy Village - home to the Caribbean's most diverse and invigorating fun park experience!!! Fill your day with 10 amazing water slides, quarter mile of lazy river, Captain Mikie's Coconut Island for the kids, great food and games galore. Stop over at Anancy Village to enjoy the go-kart and bungee trampoline, and to have an all round Jamaican cultural experience.... And one more thing, don't miss our Park Mascot, Mikie Manatee, doing the "Mikie Skank" on our Kool entertainment stage, a delight for the entire family. 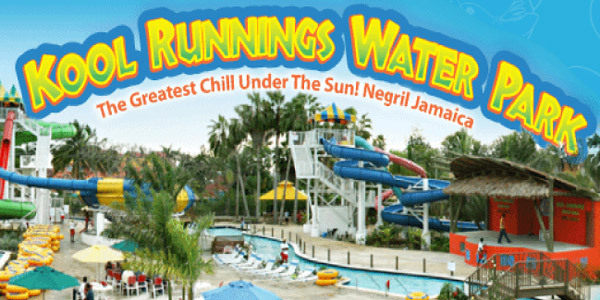 Kool Runnings Water Park is the Caribbean's premier water attraction. With over 5 acres of thrilling water rides and eye-popping dry park attractions, there's fun for the whole family! If its adventure you seek, look no further as you discover your favourite ride among the 10 diverse water slides, some towering as high as 40 feet in the air! For a more relaxing experience, let the water move you as you glide leisurely along the Rio Bueno Lazy River. Kids will enjoy the unique, interactive experience of Captain Mikie's Coconut Island with its tipping coconuts and water canons. Sample the food at any of our three restaurants, sip a smoothie at the Kool Blendz Juice Bar or sit above it all as you absorb the scenic view from the Knot Out Sports Bar. lease check our Rates and Specials section for General Admission Rates, Group Rates and any Special Packages. For more information about planning your special events at Kool Runnings, please visit the groups section of the website. RED HOT SUMMER SPECIALS JUST ADDED !!! BRAND NEW KOOL KANOE SWAMP ADVENTURE !! !